One of the first things we take into consideration when we're picking the dining room chandelier is the shape of the table. It is SO important for the shape of the table and the shape of the light to coordinate. They don't always have to have the same orientation, but they shouldn't fight each other. Usually, if your dining table is rectangular, it's best to have some sort of elongated light to follow the length of the table. This could be a linear light or some sort of oval/elongated fixture that is spread out. 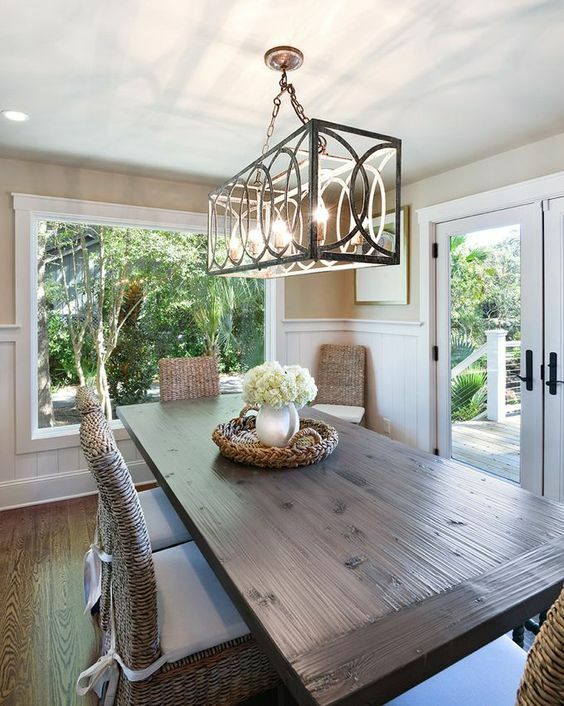 For round tables, go with a rounded or tiered fixture or even a multi-level cluster of pendants. And for oval, you have the option of either, or really. Be sure to select a shape that compliments your table. If you're set on a smaller fixture or using a round light over a rectangular table, consider hanging two instead of one. This will help balance the space out visually and offer enough lighting for guests at both ends of the table. Consider the visual weight balance of the light versus the table. If you have a glass table, don't pick something overly heavy that looks to bulky of the airy-looking glass. And if you have something wooden and early that has more substance, try to mix it up a little by incorporating a different finish to break-up the wood. Make sure the light fixture has enough bulbs to give off the amount of light you need. 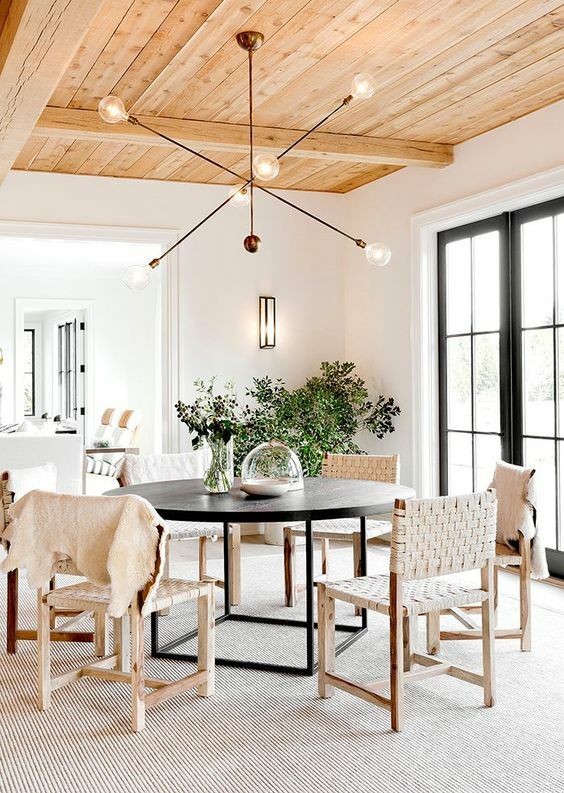 There are lots of great larger or oversized pendants that would be the good size (diameter-wise) for a dining table, but they only have one light bulb in them. Unless you have lots of can lights over your dining table too, at least 4-6 bulbs is probably necessary for guests to have enough lighting at a meal. For ambiance sake, always put your dining light on a dimmer. 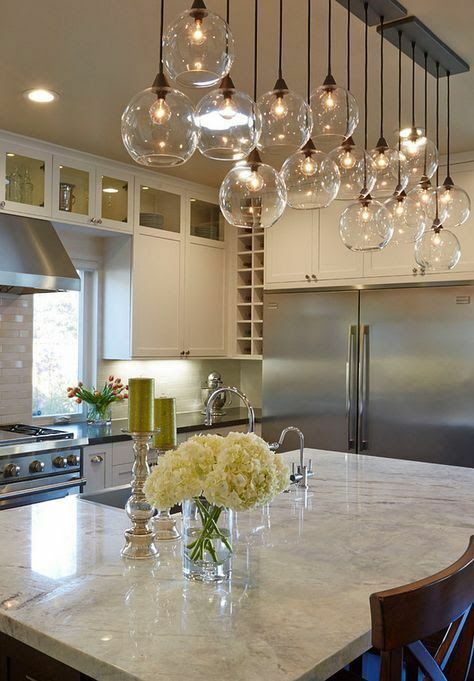 You want to be able to set the tone of a meal with your light fixture. Sometimes this requires as much lighting as possible, while other times, you don't need quite so much. A dimmer lets you control the lighting in your dining room which ultimately makes the space more versatile. Ultimately, be sure the light you pick is something you love and flows with the rest of your home. It should be a representation of your style while also creating a balance and flow in the space.